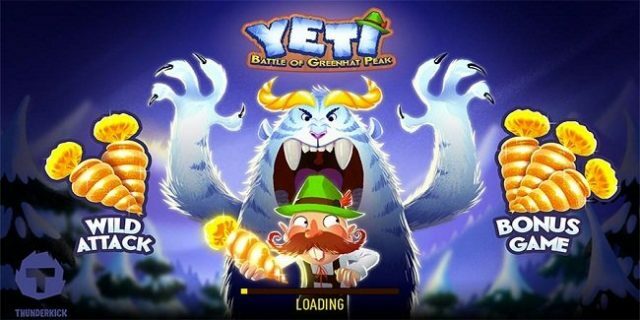 Yeti Battle of Greenhat Peak is a slot machine developed by ThunderKick software platform. This is a 5 reels and 11 paylines video slot game. Total number coins for the game is 10, while you can play this slot using your mobile phones, desktop or tablets devices for 10p per spin to £100 per spin. This slot is very adventurous and can be played at any ThunderKick casino online. The slot offers a jackpot of 300 times on your total stake and return of player percentage is over 96%. The slot features 2 bonus rounds. First bonus feature of this game is free spin bonus feature which will offer you 10 to up to 31 free spins and up to 2x of multiplier. The game also features a ‘wild attacked’ feature which will give you respin with up to 3 sticky wilds. Another feature of this beautiful slot game is ‘Sticky Wild feature’ which will turn 3 reels to fully wild. The name of this slot is Yeti (the Abominable Snowman) and as per the name, it takes place in Himalayan range of Nepal. The symbols of this slot are Yeti himself, cherries, lemons, melons, A, K, Q and J playing cards. The ‘Yeti’ is the highest paying symbol of this slot machine which will offer you 35 times of your total stake if you land 5 of these same symbols across a payline. The game includes a regular wild in the form of the moustached. The wild symbol will replace all other symbols on your screen except the bonus symbol. The golden carrot is the bonus symbol and it is a key to game. 2 of the golden carrot anywhere on your reels will trigger the Wild Attack feature. This feature will give you a chance of respin and 1 to 3 additional sticky wilds will appear on your careen. 3 bonus scatter symbol will give you 10 free spins, 4 bonus scatter will offer you 15 free spins and if you land 5 bonus scatters then you will receive 20 free spins. This slot has the ability to give you 845 times your total stake.